I like temples, I like views and I like walking – so there was no way I was missing Wat Tham Suea, a.k.a. 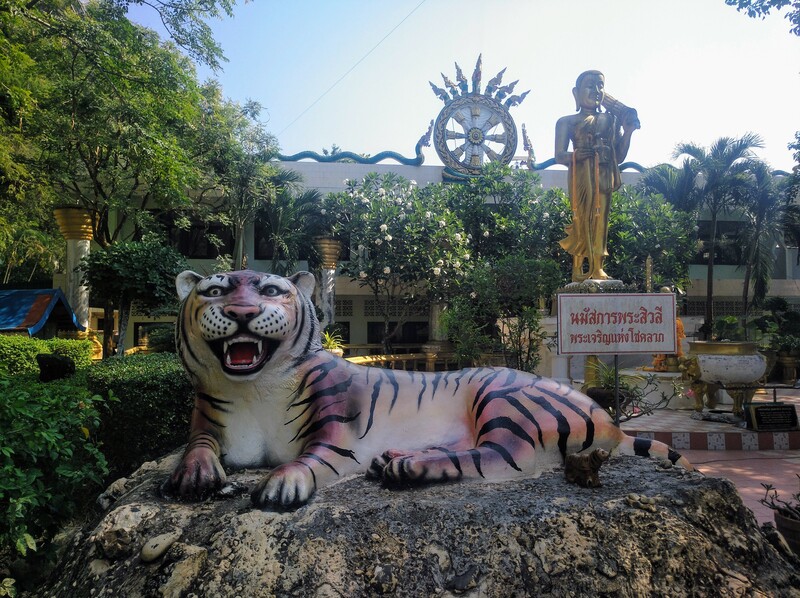 The Tiger Cave Temple, about a 20 minute songthaew ride from Krabi town, during my only full day in the region. I woke up early and took some ibuprofen to help me deal with my fever and overall weakness, that was to be my travel buddy during the whole length of my fourth trip to Thailand. Luckily, getting to the temple went as smoothly as possible. “Take the red songthaew” I had been told at the guesthouse. “That’s next to River View Hotel, a 2 minute walk from here”. The red songthaew came quickly, and well before 9 am I was entering the premises of Wat Tham Suea after handing the driver a very reasonable 50 Baht. The actual Tiger Cave Temple is at the bottom of the hill, but in many ways the main highlight is the walk up the 1237 steps to the shrine at the top – that’s a total elevation gain of of 238 m in the usual tropical heat and humidity. I bought a water bottle at a small convenience shop and started climbing, hoping to beat the crowds. The climb was steep and, as expected, it took me less than a minute to break into a familiar sweat. I felt very weak owing to my never-ending cold, but I still seemed to be climbing faster than everybody else. When I got to the platform summit, there were about five people walking around and taking pictures of the view. I would take photos too, but first I had to go through the Buddhist motions. First, I made a donation and lit an incense stick. My thoughts went to the sick (yes, especially her) and all those who don’t have the energy, time or money to come to places like this one. Then I began to walk around the stupa – three times, clockwise, slowly, trying to meditate. I asked for forgiveness to the persons I had hurt or failed to love properly since the year started. It was not easy, as some Thai teenagers were in the way, dozing in the shade provided by the stupa. Oh Thais – always so good at saving their energies! Surprisingly, I had to take more breaks on the way down the stairs than I had taken on the way up, as my legs would get into trembling fits after a number of steps. At the bottom, I quickly inspected the Tiger Cave Temple, and didn’t think much of it. I skipped the queue to have a photo taken in the actual tiger cave, but I did see tourist after tourist posing in front of the tiger statue, sitting cross legged, palms together imitating meditation or prayer. I wondered, how many such-like photos can be encountered in cyberspace? I decided to try to make it back to Krabi town as quickly as I could. It was still early, and my plan was to make it out to Ao Nang and visit the Railay peninsula. But the way back turned out to be more challenging than the way there. After quite a few minutes waiting for the red songthaew under the sun, I decided to explore alternatives. Just then I saw a young backpacker negotiating with a taxi driver. But he wouldn’t negotiate, so we started walking down the road, in the hope of seeing songthaews were the minor road met a bigger one. I liked chatting with the backpacker. She was Finnish, and was in her second gap year before starting university. And had a strange English accent. It turns out she’d spent her gap time living in Australia (which explained her accent) and traveling in SE Asia. I asked her about some of her favorite destinations. She mentioned Flores, Pai and Ko Lanta, where she got stuck for longer than expected. Just then, a man and a woman pulled over on a motorbike that had an attached roofed platform – a hybrid between a side-car and a tuk-tuk seat. My companion negotiated a price for a ride to Krabi town, but she still thought it was too expensive. We joked, this is the taxi temple scam. They make it easy and cheap for you to get there, but then you need a taxi to get back! As it goes, we met the couple again some distance down the road, and offered them 60 baht to take us to the main road where, sure enough, a red songthaew duly appeared and took us back to Krabi town, where the backpacker and I parted ways. Don’t be too hard in the kids posing for a photo while meditating. I have many such photos from my first few trips to Asia. Now as a practicing Buddhist for quite a few years I recognize the strong impressions I had in Mind back then that where just screaming at me to learn to meditate. Thank the Buddha’s I was listening. Those powerful moments changed my life. They too are in the path to enlightenment. Thanks for your comment. No – no hardness in my words. I just thought it funny that visitor after visitor (no kids in this case) would have the same photo taken with exactly the same pose. I too had powerful moments during my first encounter with Theravada Buddhism in Thailand that began with casual visits to temples and many selfies. While I have remained a Christian, I have learned a lot from Buddhist practices and, especially, conversations about Buddhism with my Thai friends. Wow that’s interesting, are you a Christian Buddhist?